OUTSIDE THE COURT today, there was chanting, relief and feelings of vindication from the six men and their supporters as they celebrated the not guilty verdicts in the Jobstown false imprisonment trial. The men were accused of falsely imprisoning former Tánaiste Joan Burton and her adviser Karen O’Connell on Fortunestown road in Jobstown, during a water charges protest in November 2014. After the verdicts were read out, supporters filtered out with signs and placards, before TD Paul Murphy and other men accused exited the building to rapturous applause. Addressing the media outside, Councillor Michael Murphy, one of the accused, said that the court case was brought simply because it was a water charges protest. 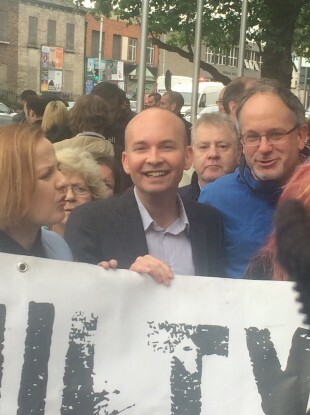 Paul Murphy, similarly, was very critical of the role that the gardaí played in the trial. On Monday, Judge Melanie Greally explicitly told the jury that the evidence given by members of An Garda Síochana contradicted what was seen in the video evidence. Paul Murphy said: ”These seven people (one man was acquitted earlier in the trial) have had this hanging over them for over two years and have spent eleven weeks in court. They are now vindicated and walk out of court proven to be protesters rather than the kidnappers Joan Burton and the Gardai said they were. This was a politically driven investigation vindictively designed to punish those who fought against water charges and wounded the political vanity of Joan Burton. It was an attempt to criminalise the largest movement of people power in decades, by presenting sit-down protests as false imprisonment. Fellow TDs came out to court to show support for Murphy and the other men after the verdicts were announced. Speaking at the steps of the Criminal Courts of Justice, Solidarity TD Mick Barry told TheJournal.ie: “I’m choking back tears to be honest. I got a text about 60 seconds before I was due to stand up in the Dáil for Leaders’ Questions. I got to break the news to Frances Fitzgerald and Brendan Howlin… This verdict is great for the six men, but it’s also great for the working class. The jury has defended the right to protest. Barry added that the case had opened up an “appalling vista” for An Garda Síochana. “There’s a lot of questions to be answered and we’ll be pressing that home after the celebrations,” he said. He said the acquittal was a “stunning defeat” of the government. Also in attendance after the verdict was Solidarity-PBP TD Bríd Smith. She told TheJournal.ie: “I’m absolutely delighted. This was a very, very serious charge indeed. “Thank god we have juries in this country,” she added, before saying that serious questions now lay with the gardaí for statements given during the trial. TheJournal.ie has sent in a request for Joan Burton’s reaction to today’s verdicts. A jubilant crowd cheered all of the defendants on the steps of the Criminal Courts of Justice, staying around well after the verdict. Email “'I'm choking back tears': Relief and vindication after Jobstown not guilty verdict”. Feedback on “'I'm choking back tears': Relief and vindication after Jobstown not guilty verdict”.